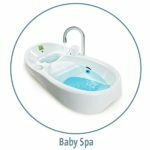 As you begin to plan ahead for baby’s arrival, you may be wondering if you need to buy a bathing tub for your little one. Of course, getting into the tub or clearing out the sink may be an option that some parents choose to go with when it comes to bathing their baby, however, a baby bathtub can turn bath time into a less tricky experience for both you and your baby. Some baby tubs are made to go only in the sink so you can bathe your baby standing up. Others are made for the bathtub and some are made to easily transition from the sink to the bathtub. 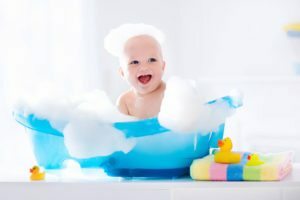 Typically, when it comes to bathing a baby, the best option is to do so in the sink for the first 6 to 7 months, before moving to a tub that fits in the bath. Some parents find it easier to bathe a baby at the sink, and moms who have had a C-section find that bathing their baby while standing is the only comfortable option. Prior to purchasing a bathing tub, decide if you want to invest in two baby tubs: one for the first 6 months and one for after your baby is ready to move into the bathtub. Or you may be looking for one tub that can do both. Take note that baby tubs that are made for the sink generally have more safety features, so it may be worth investing in this kind and buying one for the tub later. 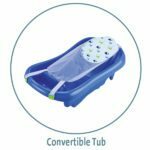 Some key features to look into when shopping for a baby tub are foam-lined contoured padding and padded headrests for comfort and support, choosing a tub with an incline for additional support and tubs that can be used past the newborn stage. From cribs and strollers to baby monitors and carriers, a new baby requires an extensive list of must-have items before their arrival. For those looking for some guided help, here’s a complete guide of key items and considerations to look into before you begin stocking up on all those essential baby items. These types of tubs are designed to adjust as your baby grows to toddler size. These typically have a plastic tub that fills with water and an attached hammock-type sling to provide extra height in the water for newborns. As your baby gets older, the sling can be removed and baby can recline or sit in the mini tub using supported backrests that are typically built in. 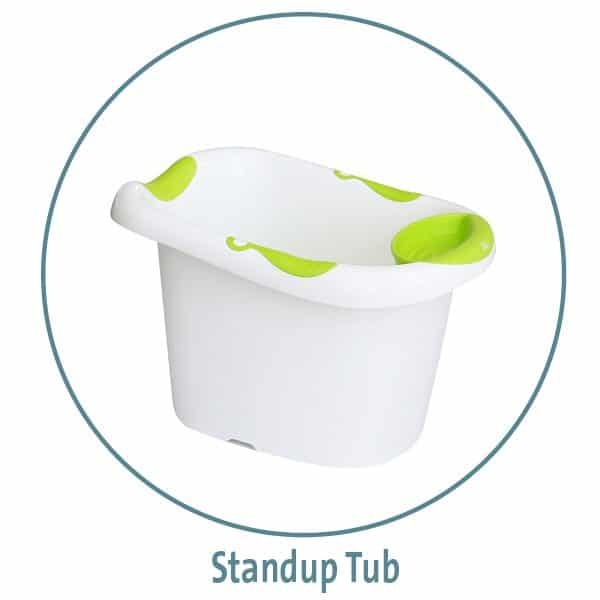 Hard plastic tubs typically have a mildew-resistant foam lining and a contoured shape that will fit your baby’s body. These types of tubs typically fill with water and have a drain plug in the base to drain. Most styles provide supports for baby’s arms and legs to prevent the baby from slipping under the water, and some styles allow those supports to be removed once baby can sit upright. If you are trying to avoid having one more, bulky thing to store when not in use, foldable tubs may be a good option. These tubs typically either fold in half or have folding legs as a stand that can be laid flat when not in use. While these may be a nice option for storing, it is important to check the stability of them, as foldable tubs may not always be as sturdy as non-foldable ones. 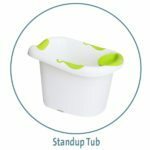 These types of baby tubs are perfect for saving space when storing or traveling and are exactly what their name suggests. Think narrow, mini kiddie pool. 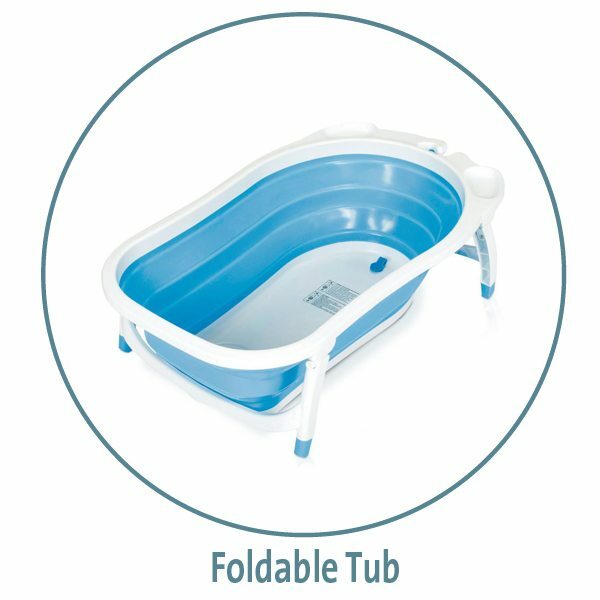 These inflated bathtubs can be placed directly into the regular bathtub and have water added to them. Many of these tubs include suction cups or hooks to hang for air-drying. The downside is that each bath time will come with the need to re-inflate the tub. 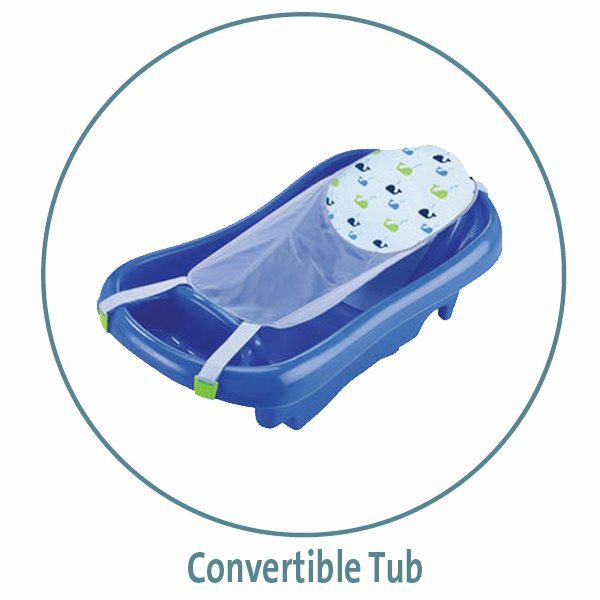 For babies that hate lying down in water, perhaps a standup tub is a better option. These bucket-style tubs are designed to emulate the womb. The baby sits upright in the bucket, while you can wash around him or her in the close space. Once your baby reaches the age that they can hold their head up on their own, a bath seat can be used under close supervision. 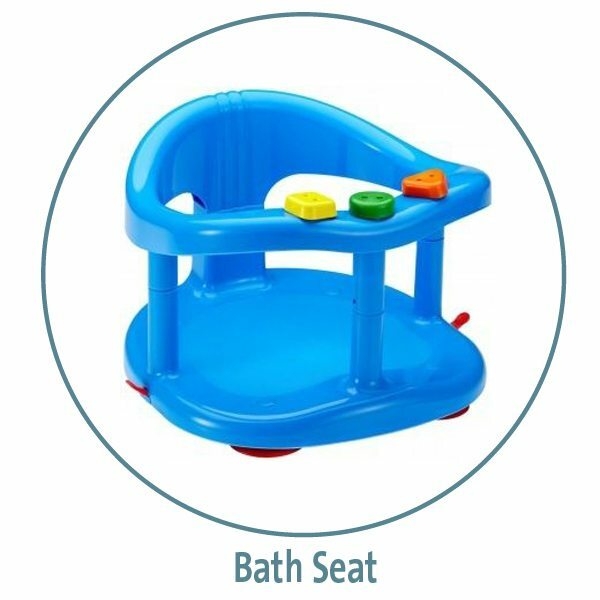 Caution: Some bath seats have been recalled due to possible drowning risk. 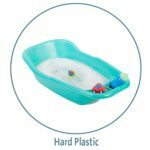 While most baby tubs are made from plastic for easy cleanup, one softer option is a cushioned bathtub. These types of tubs are actually not a tub at all, as they don’t hold water. These cushioned tubs are made from polystyrene balls covered in fabric. 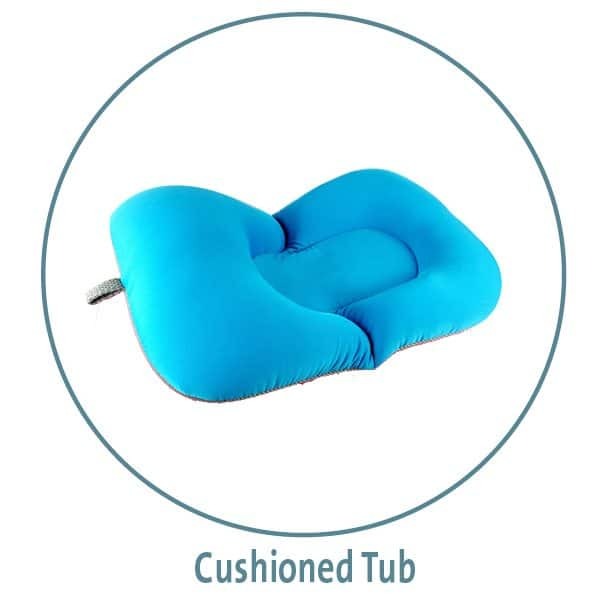 To use it, fill your regular tub up with water and add the cushion on top. 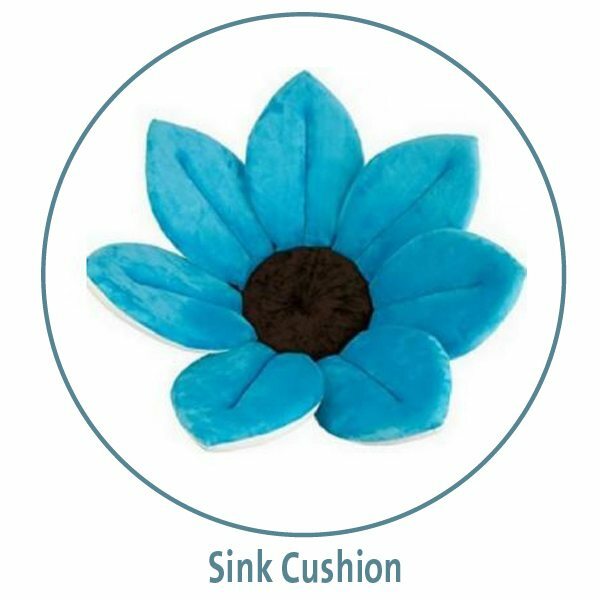 The water will soak through the fabric, providing a soft and supportive baby bath for babies that can sit upright. 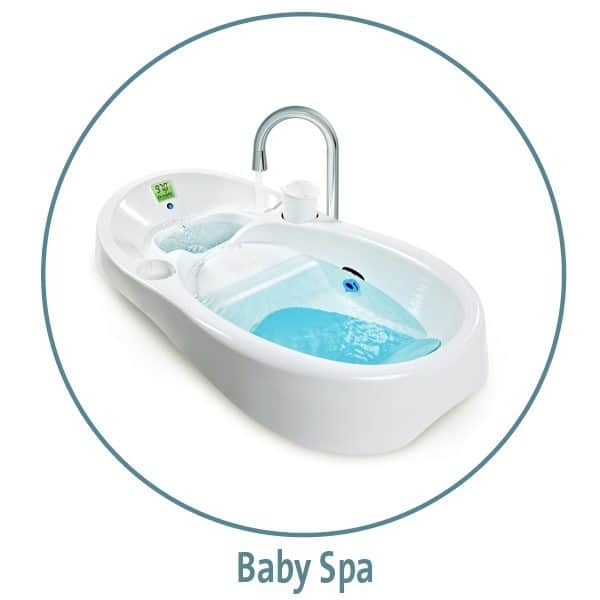 Baby “spa tubs” are upscale spas to enhance your baby’s bathing experience. While features such as water jets, temperature monitors, fresh water circulation and handheld shower units aren’t necessary to get your little one clean, some parents enjoy giving their baby more bells and whistles to enjoy. For those looking to have a safe and comfortable option for bathing their baby, but are not sold on the idea of buying a complete baby tub, bath cushions are another option. These items let you simply use a filled sink, but provide additional support and cushion to ensure baby is held up in the water. Baby tubs can range in price from around $15 to over $60. The more expensive ones usually have more safety options or additional fancy features, so it is wise to do your research and ensure you are paying for safety and not just an unnecessary luxury. Will you be traveling? 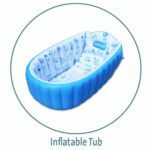 If so, you may want to consider an inflatable or foldable tub. These are very basic and inexpensive, but keep in mind, if you get a tear or hole in an inflatable tub, the tub will have to be replaced. When it comes to cleaning up after bath time, easy cleanup is a desired feature. For this reason, standard hard plastic tubs or one-piece standup tubs and buckets are the best options. 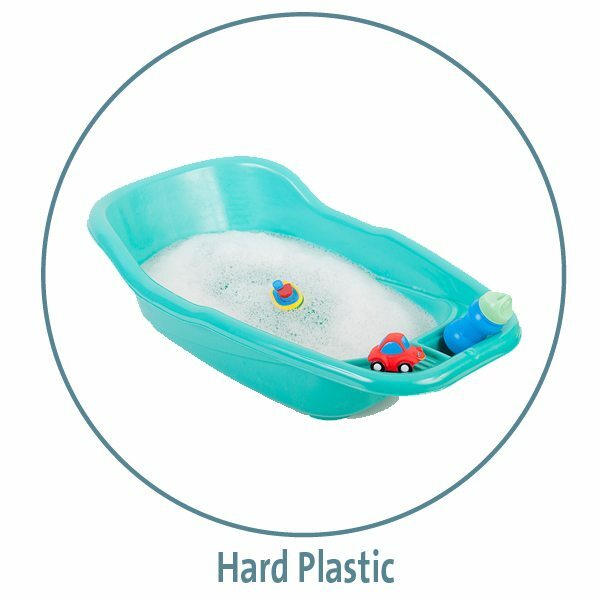 Being made out of a single piece of plastic, these tubs can be easily rinsed and dried since there are no hidden areas that catch and hide water. Foldup tubs typically provide streamlined designs and easy hang-up features to make drying a simple task. Conversely, inflatable tubs are often times harder to clean since creases exist and can trap water, leading to scum buildup and mildew. The main thing to keep in mind when it comes to clean up is to search for a tub that has no groves or textured surfaces that require scrubbing. There are many safety features to consider when choosing a baby tub. Some tubs have a feature that tests the temperature of the water and alerts you when you are in a safe or unsafe temperature range for a baby’s delicate skin. This is a wonderful feature to have if you are overly cautious and want to ensure accidents are prevented. Sling feature: This is a good option to have an extra support for holding infants or wiggly babies. This feature is best for newborns. Be attentive: The number one thing for any baby is to never leave your baby unattended, but that is even more important when bath time is concerned and one wrong slip could result in injury or drowning. Tipping: Be sure you securely fasten or place your bathtub before use as some bathing tubs may become unstable. Bath seats or standing tubs and buckets can easily tip over and can result in injury or drowning. To avoid tipping, search for tubs that have a flat bottom. Temperature: Whether you have a fancy spa-style tub with built-in thermostats or are simply filling a tub or sink with water, pay close attention to the water temperature as a baby’s and toddler’s skin are very sensitive. Extreme water temperatures can also result in internal damage in addition to burns. Proper water temperature should be just above 100 degrees Fahrenheit to prevent chilling or burning the baby. If you do not have a bath thermometer, test the water with your elbow. When you put your elbow in the water, the water temperature should feel warm, not hot. In addition, the temperature of the room should be warm to keep baby from chilling. Try to use an area free of drafts. You’ll find that there are many baby tubs to choose from. Babies have very delicate skin, so the cost definitely makes a difference when it comes to safety issues! You’ll be using a baby tub for at least six months, so a tub with as many safety features as possible is a wise choice.